Following in the footsteps of great explorers, intrepid Go Ahead travelers Vickie and David spent four days discovering the far reaches of the Earth on a tour of Antartica. With trips to all seven continents now under their travel belts, Vickie shares their experiences on the southernmost point in the world. After visiting six continents, the obvious next step for us was to visit the last one. 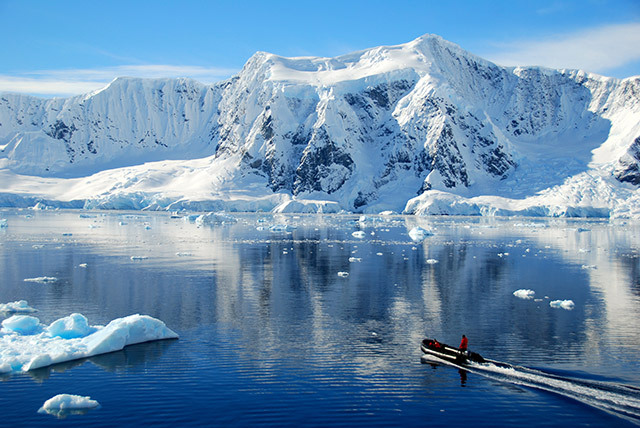 We wanted to go sooner, because our travel plan is to visit the places that are farthest away or most challenging first, and Antarctica was the last “challenging” destination on our list. It’s almost impossible to visit any place on the planet that has no signs of human activity—roads, telephone poles and buildings. Antarctica was silent. We were the last cruise of the season, so there were no other boats, and except for research or old whaling stations, there were no marks made by man anywhere. The temperatures are frigid, so you’ll want to pack smart for Antarctica. And almost as important, enough books to last both two-day crossings on the ship! Flocks of penguins porpoising past us always put a smile on our faces; on land, their waddling figures had the same effect. If you sit down and stay still, they will approach you—one came up to me, turning his head from side to side before trundling off. The scenery is indescribably beautiful and otherworldly and you don’t know where to point your camera first, because everywhere you look is so incredible. While documentary films are nice, nothing can replace a 360-degree view with the wind blowing around you. There is no more majestic sight on the planet than whales, and we saw many—including a pod of orcas. Whether they’re breaching, tail slapping or just swimming up close to the surface, there is nothing quite like seeing a whale up close in the wild. What would you most look forward to seeing on a journey to Antarctica? Tell us below!